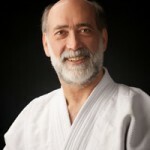 Camber started learning Aikido in 1978 in Halifax with Tom Warney, a young black belt from Montreal. For some time, Camber had been interested in learning a martial art but those that were available did not appeal to him. Judo was interesting because of its emphasis on defense without hurting the opponent but there was too much focus on competition. Camber spent a number of years wrestling; winning was nice but he always felt wrong when someone had to lose. Tae Kwon Do seemed to be very effective but the emphasis was on inflicting injury to the opponent as quickly as possible. Camber was fortunate to read an advertisement that Tom Warner had posted at the university that described Aikido as a martial art that emphasized self-defense without hurting the attacker. There was no competition in Aikido. After his first class, Camber knew that he had found what he was looking for. In 1980 after moving to Toronto, Camber became a student of Obata sensei and has had the great privilege to study with him since. One can come to Aikido for many reasons: to learn self-defense, to learn better control of one’s body movement, to learn to remain calm in stressful situations, to keep one’s body flexible and fit. Aikido can satisfy all of those needs and, no matter what benefit a student seeks initially, he or she will find others as they continue to practice. Aikido may even become an integral part of one’s life. In Aikido, one strives to learn how to harmonize their movements with those of their partner so that one guides the two bodies to a safe and secure finish. When this happens, it is effortless; it is Aikido. Something that seems so simple, often takes years to accomplish but the process of learning is always fun and when that moment of harmony happens, it is so amazing. Seemingly one has done nothing but their partner goes flying across the mat.